Well, today I got a package from the States. 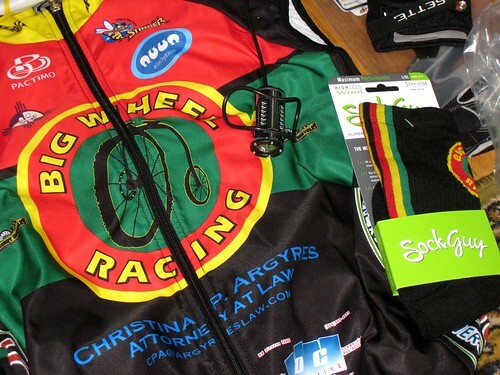 It included my uniforms for Big Wheel Racing made my Pactimo which are fantastic! I’ve always been a big fan of Voler bike clothing. I’d previously found that the quality was so much better than any custom manufacturer that I’d seen (think…. Verge which which has never impressed me, especially with their logo being larger than others on the uniform). O.K., back to the point of my post. The quality and the beauty of these uniforms is fantastic! There’s a reflective strip on the back of the jerseys and the vest. Wow! Can’t beat that, can you? Also, the sublimination is really well done too. Yes… it’s still raining and raining and raining. Ugh! In other team news. We’ve added two more folks to the Big Wheel Racing European team. First, we have Ed Husted (that’s him on the poster below) who lives in Italy but is originally from Rolla, Missouri. Next we have Marty Dudel who is also American but lives over my Heidelburg. We’ll be adding some more non-Ami’s as we go on. Please welcome these boys to the team. Ed is racing in an Italian 24 Hour Series and the first race comes up on Easter weekend. Kera and I might go down and play support crew for him. We need to figure that out.